Born to a family of scientists — my father an engineer and my mother an oral surgeon — I was given a clear message that I could do anything. Case in point: At age nine when I declared my career goal of being “president of the world” nobody batted an eyelash. Their unwavering confidence followed me through college at UC Berkeley and medical school at Harvard and continues to be a sustaining factor in moments of doubt. Entering medical school, I was certain I would not become a surgeon. The stereotypes and messages about surgeons being malignant and aggressive deterred me. Independent of the people and the culture, I fell in love with operating and treating surgical disease. I followed my heart, my passion, and my talent to the field of plastic surgery and did not turn back. Countless mentors (most of whom did not look like me) were vested in my success and allowed me to grow in this challenging field. To my surprise, I was the first black woman to complete the Harvard Combined Plastic Surgery Residency Program. I didn’t know there were still “firsts” like that. While I was fortunate to train with four female plastic surgery attendings over the course of my residency, there were some aspects of my experience as a “first” which felt unique, lonely, and difficult to share. Being a surgeon is challenging for anyone. However being a female surgeon and a black woman add additional layers of frustration. Verbally, the message can be clear: “Are you going to do my surgery?” or “When is the doctor coming?” from a patient; or as stated by a colleague, “We really have to get you into a white coat so that you can look like an attending.” In actions, the sentiment can be even more explicit and hurtful. Patients hand me the meal tray when I enter the room, or continue talking as if I had never entered at all. I speak to an anesthesiologist who is so focused on determining the title on my name badge that she misses all of my instructions about the case. During residency I remember receiving a page at 3 a.m. for what would be my seventh consultation that night. There was a family who came in for treatment of a small laceration on their child’s lip. They seemed confused as I entered the room. Their demeanor questioned my abilities and they stated outright that they were transferred from another hospital because they needed “one of the old white male surgeons” to take care of their child. I was tired and definitely not in the mood for this exchange. I was there to provide care and to help, not to deal with their racism and sexism. Even more aggravating was that my fellow medical colleagues had validated these false expectations. I willed my lips into a smile, channeled my inner nine-year-old president, and told them that luckily for them, they got me tonight and that they were in the best possible hands. Yet another experience occurred as the chief resident. I entered the room with my team that happened to be comprised entirely of males with the exception of the nurse practitioner and myself. We had been rounding on this particular patient for the last three weeks dealing with a challenging abdominal wound. I informed the family of the plan for the day and delegated one of my junior residents to return and change the dressings. Later on, I returned to check on the patient and to verify that the task had been successfully completed. As I started looking at the dressings the patient’s mother anxiously requested that I consult with “Dr. Junior Surgeon” before making any changes. I laughed and informed her that as a member of my team “Dr. Junior Surgeon” reports to me and not vice versa. It was interesting to watch the awareness slowly manifest itself upon her face. She blushed, apologized profusely and said she hoped she had not gotten “Dr. Junior Surgeon” in trouble. She was an extremely lovely lady and until that moment, I believe she was unaware of the degree to which she was influenced by these stereotypes. On top of all the pressures already inherent to being a surgeon, each of these moments required emotional restraint and redundant explanations that I was, in fact, the surgeon. While it is rewarding to make people (patients and their families, colleagues and hospital staff) aware of their biases and shatter stereotypes it can also be frustrating, burdensome and repetitive. My energy should be focused upon caring for my patients, not defending my position. Contemplating the amount of time and energy spent on these interactions makes me feel resentful and cheated out of some of the joys of being a surgeon. Constant messages that you are not the right person for the job can be particularly damaging in a field where confidence is key. I realized that I was not alone with fleeting moments of self-doubt when a surgeon well known to be tough as nails described to me how a medical error brought him to tears as he hid on one of the back staircases at the hospital. Many highly successful professionals suffer from imposter syndrome, and highly successful female professionals disproportionately so. In spite of the quantitative and qualitative proof of success, there persists an internal voice that wonders if you will soon be discovered, and everyone will know that you do not belong. In surgery, confidence is essential, but the truth is that surgeons have moments of doubt. When I am daunted by a particularly difficult case, or perhaps recovering from a recent complication and trying to get back on the horse, it is taxing to muster the additional energy needed to enter the hospital and overcome the verbal and nonverbal messages challenging my position, knowledge and training; telling me I do not belong. 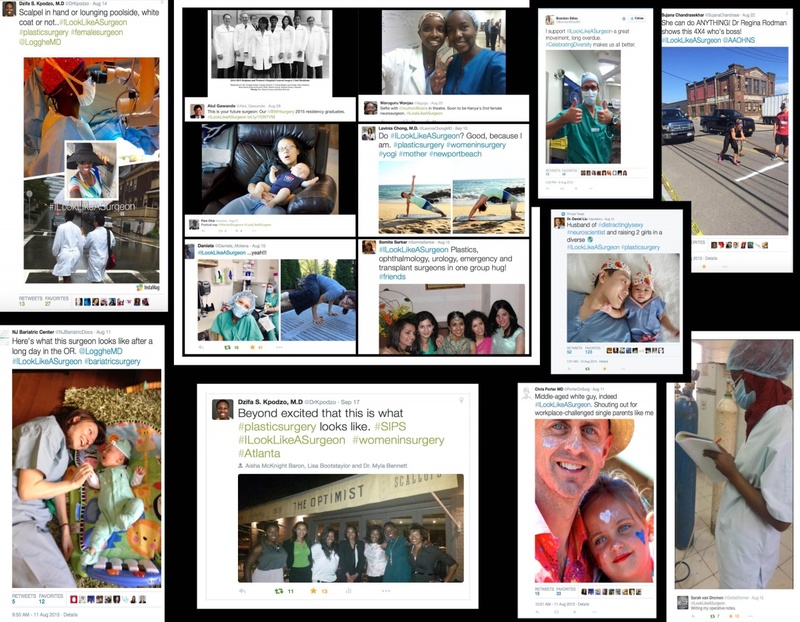 Heather Logghe’s “ILookLikeASurgeon” hashtag has been a rousing call to action about diversity in surgery. The response in social media has been inspirational and indeed overwhelming at times. #ILookLikeASurgeon is the loud answer to the subtle but insistent question that hovers over women and other under-represented groups in surgery … do you belong? From the outpouring of responses to #ILookLikeASurgeon, it is very clear that surgeons have been aching to look that 100 pound gorilla in the room squarely in the eye and say YES! Even patients are weighing in and expressing that they are tired of the stereotypes, and that race and gender should not affect care. Seeing my fellow surgeons of all ages, genders, ethnicities and backgrounds share who they are inside and outside of their surgical masks has been magnificent. Their tweets and photographs show complex women and men like me with amazing talents, interesting hobbies, families and successful careers. With every tweet I am reminded that I am not alone; I am not an imposter. There are many others in the ranks, and we share a powerful collective experience. Thank you, Heather, for distilling the problem in such a compelling way and giving it voice. Being a surgeon is not determined by age, race or gender. Regardless of societal expectations and stereotypes, #ILookLikeASurgeon, along with countless surgeons the world over who have shared their image and voice in the movement. May we continue to post our pictures, celebrating the diversity of our profession and our lives. Dzifa S. Kpodzo is a plastic and reconstructive surgeon. Plastic surgery is more than Botox. Hopefully doctors can remember that.